All cells were grown on tissue culture dishes or multi-well plates (Corning) at 37 °C and 5% CO2. CHO-K1 cells (ATCC CCL-61) were phenotypically validated as proline auxotrophs and their Cricetulus griseus origin was confirmed by genomic sequencing. CHOP:GFP and XBP1s:Turquoise reporters were introduced sequentially under G418 and puromycin selection to generate the previously described derivative CHO-K1 S21 clone12. The puromycin-resistance marker was subsequently lost, rendering CHO-K1 S21 cells sensitive to puromycin. The cells were cultured in Nutrient mixture F-12 Ham (Sigma) supplemented with 10% (v/v) serum (FetalClone II; HyClone), 1× Penicillin–Streptomycin (Sigma), and 2 mM L-glutamine (Sigma). HEK293T cells (ATCC CRL-3216) were cultured in DMEM (Sigma) supplemented as above. Cell lines were subjected to random testing for mycoplasma contamination using the MycoAlert Mycoplasma Detection Kit (Lonza). Experiments were performed at cell densities of 70–90% confluence. Cells were treated with drugs at the following final concentrations: 0.5 µM thapsigargin (Calbiochem) and 2.5 µg/ml tunicamycin (Melford) first diluted in fresh, pre-warmed medium, and then applied to the cells by medium exchange. Supplementary Table 1 lists the plasmids used in this study. Standard PCR and molecular cloning methods were used to generate DNA constructs, and point mutations were introduced by PCR-based site-directed mutagenesis. Supplementary Table 2 lists all primers used in this study. Two single guide RNA sequences (plasmids UK1839 and UK1840) for targeting the third exon of Cricetulus griseus (Chinese hamster) MANF were selected from the CRISPy database [http://staff.biosustain.dtu.dk/laeb/crispy/43] and duplex DNA oligonucleotides of the sequences were inserted into the pSpCas9(BB)-2A-mCherry plasmid (plasmid UK1610) following published procedures44. In total, 2 × 105 CHO-K1 S21 cells were plated in six-well plates. Twenty-four hours later, the cells were transfected with 2 µg of guide RNA/Cas9 plasmids UK1839 and UK1840 using Lipofectamine LTX (Invitrogen). Thirty-six hours after transfection, the cells were washed with PBS, resuspended in PBS containing 4 mM EDTA and 0.5% (w/v) BSA, and mCherry-positive cells were individually sorted by fluorescence-activated cell sorting (FACS) into 96-well plates using a MoFlo Cell Sorter (Beckman Coulter). Clones were then analyzed by a PCR-based assay to detect MANF mutations as described previously45. Briefly, primers were designed for the region encompassing the MANF RNA guide target sites, and the reverse primer was labeled with 6-carboxyfluorescein (6-FAM) on the 5ʹ end. A PCR reaction was set up using 5 µl of AmpliTaq Gold 360 Master Mix (Applied Biosystems), 0.6 µl of a mix of forward and labeled reverse primers (each at 10 µM), 3.4 µl of H2O, and 1 µl of genomic DNA (~10 ng/µl). PCR was performed as follows: 95 °C for 10 min, 10 × (94 °C for 15 s, 59 °C for 15 s, 72 °C for 30 s), 20 × (89 °C for 15 s, 59 °C for 15 s, 72 °C for 30 s), 72 °C for 20 min. PCR products were diluted 1:100 in water and fragment length was determined on a 3130xl Genetic Analyzer (Applied Biosystems), and the data were analyzed using the Gene Mapper software (Applied Biosystems). Clones for which frameshift-causing insertions or deletions were detected for both alleles were sequenced to confirm the MANF mutations. In an attempt to rescue the MANF-deficiency phenotype in CHO-K1 S21 MANF-/- cells, these cells were targeted with puromycin-resistant retrovirus expressing FLAG-M1-MANF. For that, HEK293T cells were split onto 6-cm dishes 24 h prior to co-transfection of pBABE Puro plasmids46 empty or encoding FLAG-M1-MANF (UK2058 or UK2059, respectively) with VSV-G retroviral packaging vectors, using TransIT-293 Transfection Reagent (Mirus) according to the manufacturer’s instructions. Sixteen hours after transfection, medium was changed to medium supplemented with 1% (w/v) BSA (Sigma). Retroviral infections were performed following a 24-h incubation by diluting 0.45-µm filter-sterilized cell culture supernatants at a 1:1 ratio into CHO-K1 S21 cell medium supplemented with 10 µg/ml polybrene (8 ml of final volume) and adding this preparation to CHO-K1 S21 MANF-/- cells (1 × 106 cells seeded onto 10-cm dishes 24 h prior to infection). Infections proceeded for 8 h, after which the viral supernatant was replaced with fresh medium. Forty-eight hours later, the cells were split into 10-cm dishes containing medium supplemented with 6 µg/ml puromycin, and 24 h afterwards this was changed to medium supplemented with 8 µg/ml puromycin. The medium was changed every third day until puromycin-resistant colonies were visible. Three clones from each population were expanded and analyzed by flow cytometry (to assess UPR induction) and SDS-PAGE/immunoblotting (to check for FLAG-M1-MANF expression). Cell lysis was performed according to a previously published procedure47 as follows: mammalian cells were cultured on 10-cm dishes and allowed to grow for ~36 h. Before lysis the dishes were placed on ice, washed with ice-cold PBS, and cells were detached in PBS containing 1 mM EDTA using a cell scraper. The cells were sedimented for 5 min at 370×g at 4 °C and lysed in lysis buffer [20 mM HEPES–KOH pH 7.4, 150 mM NaCl, 2 mM MgCl2, 10% (v/v) glycerol, 1% (v/v) Triton X-100] containing protease inhibitors (2 mM PMSF, 4 µg/ml pepstatin, 4 µg/ml leupeptin, 8 µg/ml aprotinin) for 10 min on ice. For FLAG-M1 immunoprecipitations cells were lysed in TBS/Ca2+ lysis buffer [50 mM Tris-HCl pH 7.4, 150 mM NaCl, 10 mM CaCl2, 10% (v/v) glycerol, 1% (v/v) Triton X-100] containing protease inhibitors. The lysates were cleared for 10 min at 21,000× g at 4 °C. Bio-Rad protein assay reagent was used to determine the protein concentrations of lysates followed by normalization. For analysis by SDS-PAGE, SDS sample buffer was added to the lysates and proteins were denatured by heating for 10 min at 70 °C before separation on 12.5% SDS polyacrylamide gels. After separation by SDS-PAGE, the proteins were transferred onto PVDF membranes. Membranes were blocked with 5% (w/v) dried skimmed milk in TBS (25 mM Tris-HCl pH 7.5, 150 mM NaCl) and incubated with primary antibodies followed by IRDye fluorescently labelled secondary antibodies (LI-COR). Membranes were scanned with an Odyssey near-infrared imager (LI-COR). Primary antibodies against hamster BiP (chicken anti-BiP, 1:2000;48), actin (mouse anti-actin, 1:2000; Abcam, cat. # AB3280), MANF (chicken anti-MANF, 1:1000; see below), FLAG-M1 (mouse anti-FLAG-M1, 1:1000; Sigma, cat. # F3040), and A1AT (mouse anti-A1AT monoclonal, 1:5000; Abcam, cat. # AB9399) were used. The effect of MANF-deficiency on UPR signaling was analyzed by flow cytometry. The sensitivity to UPR induction was tested by treating cells with the UPR-inducing compound, thapsigargin, for 16 h before analysis. Briefly, cells were washed with PBS and collected in PBS containing 4 mM EDTA, and single-cell fluorescence signals (20,000/sample) were analyzed by dual-channel flow cytometry with an LSRFortessa cell analyzer (BD Biosciences). GFP and mCherry fluorescence was detected with excitation laser 488 nm, filter 530/30, and excitation laser 561, filter 610/20, respectively. Data were processed using FlowJo and median reporter analysis was performed using Prism 5 (GraphPad). An example of the gating strategy is presented in Supplementary Fig. 6. In order to assess the relative amount of MANF that is secreted (Fig. 1d), CHO-K1 S21 MANF−/− cells and MANF−/− cells stably expressing FLAG-M1-MANF were grown in six-well plates for 48 h, and at time = 0 the medium was changed to 1 ml of medium without serum supplemented with thapsigargin. At the indicated times, the cell culture supernatants were collected, centrifuged for 10 min at 3000× g at 4 °C, and 900 μl were transferred to a new tube containing 100 μl of 10 × TBS/Ca2+ lysis buffer without glycerol. For immunoprecipitation of FLAG-M1-MANF, 15 μl ANTI-FLAG-M1 Agarose Affinity Gel (Sigma, cat. # A4596) were washed in TBS/Ca2+ lysis buffer without glycerol and then added to the prepared cell culture supernatants, and incubated overnight at 4 °C. The beads were then recovered by centrifugation for 1 min at 845× g and washed three times for 3 min at 4 °C with TBS/low Ca2+ buffer [50 mM Tris-HCl pH 7.4, 150 mM NaCl, 2 mM CaCl2, 0.1% (v/v) Triton X-100] containing protease inhibitors. Bound proteins were eluted by addition of 2 × SDS sample buffer and heating for 10 min at 70 °C. Equal volumes of the samples were loaded on a 12.5% SDS polyacrylamide gel. Cells from the same dishes were lysed in TBS/Ca2+ lysis buffer, and samples of the normalized cell lysates (45 μg) were loaded as a control. FLAG-M1-MANF, BiP, and actin were detected by immunoblotting. In order to assess the efficiency of the FLAG-M1 immunoprecipitation and FLAG-M1-MANF stability in the cell culture medium (Supplementary Fig. 1c), 3, 15, and 30 μg of total protein extracted from CHO-K1 S21 MANF−/− cells stably expressing FLAG-M1-MANF were added to serum-free medium and incubated for 0 or 120 min under the same conditions as the ones where cells are grown. At the end of the incubation time, a FLAG-M1 immunoprecipitation was performed and bound proteins were eluted as above. Equal volumes of the immunoprecipitation samples and samples of the cell lysates were loaded as an “input” control on a 12.5% SDS polyacrylamide gel, and analyzed by immunoblotting. 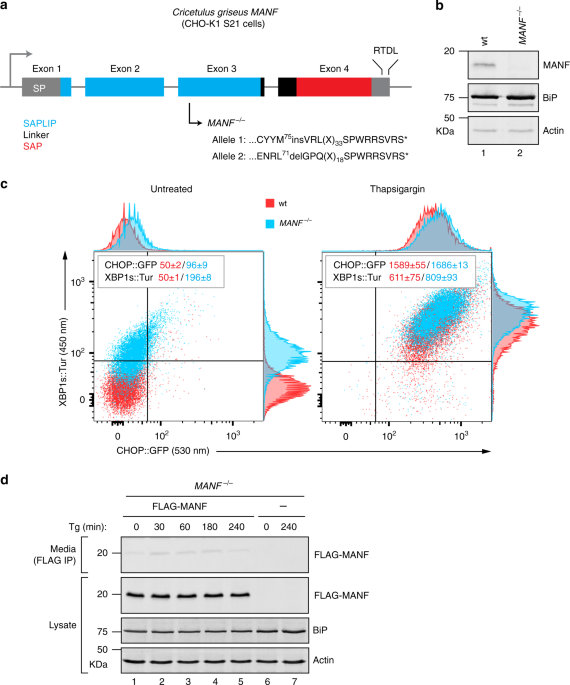 In order to confirm BiP–MANF interaction in vivo, CHO-K1 S21 MANF−/− cells and MANF−/− cells stably expressing FLAG-M1-MANF were subjected to in vivo cross-linking, followed by FLAG-M1 co-immunoprecipitation and analysis by mass spectrometry. In vivo cross-linking was performed following a previously published protocol49 with modifications. Cells were grown in 10-cm dishes (six plates per sample) and washed twice with PBS containing 0.1 mM CaCl2 and 1 mM MgCl2. For cross-linking, 1 mM dithiobis(succinimidyl propionate) (DSP; Thermo Scientific Pierce, cat. # 22585) was prepared by dilution into pre-warmed PBS (37 °C) containing 0.1 mM CaCl2 and 1 mM MgCl2, and exposed to the cells for 2 h on ice. Then, the DSP-containing solution was removed and the residual DSP was quenched by incubating the cells for 15 min with PBS containing 0.1 mM CaCl2, 1 mM MgCl2, and 2 mM Tris-HCl pH 7.4. After removing the quenching solution, the cells were washed with PBS containing 0.1 mM CaCl2 and 1 mM MgCl2, and then detached in PBS using a cell scraper. The cells were sedimented for 5 min at 370× g at 4 °C and lysed in TBS/Ca2+ lysis buffer for 10 min on ice. A post-nuclear supernatant was prepared by centrifugation for 5 min at 800× g at 4 °C, and then transferred into a new reaction tube and cleared twice for 10 min at 21,000× g at 4 °C. Bio-Rad protein assay reagent was used to determine the protein concentrations of lysates followed by normalization. For immunoprecipitation of FLAG-M1-MANF, 40 μl ANTI-FLAG-M1 Agarose Affinity Gel were washed in TBS/Ca2+ lysis buffer without glycerol and then added to the cleared lysates and incubated 2 h at 4 °C. The beads were then recovered by centrifugation for 1 min at 845× g and washed three times at 4 °C with TBS/low Ca2+ buffer, containing protease inhibitors. Bound proteins were eluted by addition of 2 × SDS sample buffer and heating for 10 min at 70 °C. Equal volumes of the samples were loaded on a 12.5% SDS polyacrylamide gel. Samples of the normalized cell lysates (15 μg) were loaded as an “input” control. The gel was stained with Coomassie (InstantBlue; Expedeon), and selected bands were cut out for in-gel digest with trypsin endopeptidase and analysis by mass spectrometry. The interaction of endogenous BiP with the FLAG-tagged null Hong Kong variant of α1-antitrypsin (AAT-NHK-QQQ-3×FLAG) was analyzed according to a previously described procedure34 as follows: CHO-K1 S21 wild-type and MANF−/− cells were mock transfected or transfected with 4 µg of plasmid UK2283 using Lipofectamine LTX (Supplementary Fig. 5d). Forty hours after transfection, cells were harvested as described above. The lysates were cleared twice, normalized for their protein content, and equal quantities of the lysates were incubated with 15 μl of ANTI-FLAG-M2 beads (Sigma, cat. # A2220) for 1 h at 4 °C. The beads were then recovered by centrifugation for 1 min at 845× g and washed three times for 3 min at 4 °C with lysis buffer containing protease inhibitors. Bound proteins were eluted by addition of 2 × SDS sample buffer and heating for 10 min at 70 °C. Equal volumes of the samples were loaded on a 12.5% SDS polyacrylamide gel. Samples of the normalized cell lysates (60 μg) were loaded as a control. AAT-NHK-3×FLAG and endogenous BiP were detected by immunoblotting with FLAG-M2- and BiP-specific antibodies. Isolation of high-molecular-weight complexes was performed following a modified protocol described previously32. Cells cultured in 10-cm dishes (four plates per sample) were grown for 24 h, then the medium was exchanged 12 h before treatment with tunicamycin for 15 h. Cells were then washed with ice-cold PBS and detached in PBS containing 2 mM EDTA and 20 mM N-ethylmaleimide (NEM) using a cell scraper. The cells were sedimented for 5 min at 370× g at 4 °C and lysed in 120–200 µl of buffer BP [20 mM HEPES–KOH pH 7.5, 250 mM sucrose, 100 mM NaCl, 2.5 mM CaCl2, 20 mM NEM, 10% (v/v) glycerol, 1% (v/v) Triton X-100] containing protease inhibitors, for 5 min on ice. A post-nuclear supernatant was prepared by centrifuging for 5 min at 800× g at 4 °C. Bio-Rad protein assay reagent was used to determine the protein concentrations of lysates followed by normalization. Equal amounts of total protein (1–1.5 mg) were brought to room temperature and adjusted to 1% (v/v) SDS in a final volume of 150 µl. This sample was then layered on a 2 × volume (300 µl) cushion [20% (v/v) glycerol, 20 mM HEPES–KOH pH 7.4, 0.5% (v/v) Triton X-100, 0.8% (v/v) SDS], followed by ultra-centrifugation for 45 min at 100,000× g at 4 °C (using a TLA-110 rotor; Beckman Coulter). The supernatant was then carefully removed without disturbing the pellet. The pellet was resuspended in 25 µl of urea loading buffer [8 M urea, 40 mM Tris-HCl pH 6.8, 1.36% (v/v) SDS, 0.002% (w/v) bromophenol blue, 7.5% (v/v) glycerol, 100 mM DTT], by shaking 5 min in a horizontal shaker at 700 rpm at 23 °C. After 1 h further incubation at 23 °C, the resuspended pellet was heated at 30 °C for 5 min before loading on a 12.5% SDS polyacrylamide gel alongside samples of the normalized cell lysates (30 μg) used as an “input” control. The gels were stained with Coomassie and analyzed by immunoblotting. The experimental strategy for the stable isotope labeling by amino acids in cell culture (SILAC) experiment33 is outlined in Fig. 6b, and samples were prepared as follows: CHO-K1 S21 wild-type and MANF−/− cells were adapted to Ham’s F12 medium minus L-arginine and L-lysine for SILAC (Pierce, cat. # 88424) supplemented with 10% (v/v) dialyzed fetal bovine serum (Gibco, cat. # 26400-044), 1 x Penicillin–Streptomycin (Sigma), 2 mM L-glutamine (Sigma), 280 mg/l L-proline (Sigma, cat. # P5607), 62.5 mg/l L-lysine monohydrochloride (referred to as light lysine; Sigma, cat. # L8662) and 60.5 mg/l L-arginine monohydrochloride (referred to as light arginine; Sigma, cat. # A6969), and incubated as described above. Once adapted, the cells were cultured in SILAC medium containing either light L-lysine monohydrochloride and L-arginine monohydrochloride (as above) or R10 L-arginine monohydrochloride (referred to as heavy arginine; CK Isotopes, cat. # CNLM-539) and K8 L-lysine monohydrochloride (referred to as heavy lysine; CK Isotopes, cat. # CNLM-291) for several passages (>15 cell divisions) before expansion in four 10-cm dishes per sample. The cells were grown to 70–90% confluence, and the medium with or without tunicamycin was exchanged 15 h before harvesting, as described above (Isolation of high-molecular-weight complexes). After normalization of the post-nuclear supernatants for equal total protein concentration (by the Bio-Rad protein assay reagent), equal volumes of each sample were mixed (1:1 ratio) as indicated and high-molecular-weight complexes were isolated as described above. Samples of the normalized cell lysates (30 μg) were used as an “input” control. The SILAC samples were resolved ~2 cm into a pre-cast 4–12% Bis-Tris polyacrylamide gel. The lanes were excised and cut in four equal pieces, and the proteins were reduced, alkylated, and digested in-gel with trypsin endopeptidase. The resulting tryptic peptides were analyzed by LC-MS/MS using a Q Exactive Plus coupled to a RSLCnano3000 (Thermo Scientific). Peptides were resolved on a 50-cm EASY-spray column (Thermo Scientific) using a gradient rising from 10 to 40% solvent B (80% MeCN, 0.1% formic acid) by 42 min. MS spectra were acquired at 70,000 (fwhm) between m/z 400 to 1500. MSMS data were acquired in a 10 top DDA fashion. Data were processed using Maxquant 1.5.8.3 with searches performed against a UniProt Chinese hamster and CHO database (downloaded 09/05/2018 and 10/05/2018 with 34,717 and 23,884 entries, respectively). Carbamidomethyl (C) was set as a fixed modification with oxidation (M) and acetyl (protein N-terminus) as variable modifications. Protein and peptide FDR were set at 1% and the re-quant function was turned off. Full-length mouse MANF (wild-type and mutants; UK2006, UK2209, UK2210, UK2212, UK2280) and SAP domain (126-169; UK2079) were expressed in the Origami B (DE3) E. coli strain (New England BioLabs, cat. # C3029). These constructs all contained an N-terminal His6-Smt3 tag. The bacterial cultures were grown at 37 °C to an optical density (OD600) of 0.8 in 2 × TY medium supplemented with 100 μg/ml ampicillin, and expression of recombinant protein was induced at 22 °C for 16 h by the addition of 0.5 mM isopropylthio β-D-1-galactopyranoside (IPTG). After harvesting by centrifugation, the pellets were suspended in the HisTrap column-binding buffer (20 mM Tris-HCl pH 7.4, 0.5 M NaCl, 20 mM imidazole) containing Benzonase nuclease (1000 U per 1 l of expression culture; Sigma). The cells were crushed by a cell disruptor (Constant systems) at 30 kPSI and the obtained lysates were cleared by centrifugation for 1 h at 45,000× g. The supernatant was applied to a pre-equilibrated 5 ml HisTrap column (GE Healthcare) using a peristaltic pump. After washing with about 100 ml of the binding buffer, the bound fusion protein was eluted with 20–200 mM imidazole gradient using a FPLC purifier system (ÄKTA; GE Healthcare). Peak fractions were pooled and digested with SENP2 protease (at final 0.01 mg/ml; produced in-house) to cleave off the His6-Smt3 tag overnight at 4 °C. After complete digestion, the remaining full-length fusion protein and His6-Smt3 tag were removed by binding back to a HisTrap column. Following buffer exchange to lower salt buffer (10 mM HEPES–KOH pH 7.4, 50 mM NaCl), the intact protein was further purified by cation exchange chromatography using a HiTrap SP HP column (GE Healthcare) and eluted by the 50–500 mM NaCl gradient in 10 mM HEPES–KOH pH 7.4. The elution peak fractions were concentrated using centrifugal filters (Amicon Ultra, 10 kDa MWCO; Merck Millipore) and proteins were snap-frozen in liquid nitrogen and stored at −80 °C. Samples of fractions from each purification step were analyzed by SDS-PAGE and Coomassie staining. Protein samples for crystallization were further purified using a HiLoad 16/600 Superdex 75 prep grade gel filtration column equilibrated with 10 mM Tris-HCl pH 7.4 and 0.15 M NaCl. N-terminal His6-Smt3 Chinese hamster BiP NBD (28–413; UK2039, UK2022) was expressed in M15 E. coli cells (Qiagen) (as described above in 2 × TY containing 100 µg/ml ampicillin and 50 µg/ml kanamycin) and purified by sequential nickel chelating, His6-Smt3 tag cleavage, reverse nickel chelating, anion exchange chromatography using a HiTrap Q HP column (GE Healthcare), and size-exclusion chromatography, as described above. The lidless Chinese hamster BiPV461F (28–549; UK2121) was expressed in M15 E. coli cells and purified by sequential nickel chelating, anion exchange and size-exclusion chromatography. N-terminally GST-tagged MANF or individual MANF domains (UK2013, UK1987, UK2004, UK2005) were used for biochemical assays. Protein expression was performed in Origami B (DE3) E. coli cells and induced as described above. The bacterial pellets were re-suspended in PBS containing Benzonase nuclease. The supernatants of the cell lysates were applied to a 5 ml GSTrap 4B prepacked column (GE Healthcare) using a peristaltic pump. After washing with 100 ml of PBS, the fusion protein was eluted with 30 mM Tris-HCl pH 7.4, 0.1 M NaCl, and 40 mM reduced glutathione. Fractions containing the fusion proteins were collected and digested with TEV protease at 100:1 (protein:protease) molar ratio for 16 h at 4 °C. The GST-tag was removed by binding back to a GSTrap 4B column. N-terminal His6-Smt3 human Grp170 (UK2225) was expressed in E. coli BL21 T7 Express lysY/Iq cells (New England BioLabs, cat. # C3013) and induced and purified by sequential nickel chelating, His6-Smt3 tag cleavage, reverse nickel chelating, and anion exchange chromatography, as described above. Full-length wild-type and T229A-V461F mutant Chinese hamster BiP proteins carrying an N-terminal His6 tag (UK173 and UK1825) were expressed in M15 E. coli cells. The bacterial cultures were grown at 37 °C to OD600 0.8 in LB medium containing 50 µg/ml kanamycin and 100 µg/ml ampicillin. Protein expression was induced with 1 mM IPTG and cells were further incubated at 37 °C for 6 h. The cells were harvested by centrifugation and lysed with a high-pressure homogenizer (EmulsiFlex-C3; Avestin) in buffer A [50 mM Tris-HCl pH 7.5, 500 mM NaCl, 1 mM MgCl2, 0.2% (v/v) Triton X-100, 10% (v/v) glycerol, 20 mM imidazole] containing protease inhibitors and 0.1 mg/ml DNaseI. The lysates were centrifuged for 30 min at 25,000× g and incubated with 1 ml Ni-NTA agarose (Qiagen) per 1 l of expression culture for 2 h rotating at 4 °C. The matrix was then transferred to a gravity-flow column and washed with buffer B [50 mM Tris-HCl pH 7.5, 500 mM NaCl, 0.2% (v/v) Triton X-100, 10% (v/v) glycerol, 30 mM imidazole] followed by buffer C [50 mM HEPES–KOH pH 7.4, 300 mM NaCl, 5% (v/v) glycerol, 10 mM imidazole, 5 mM β-mercaptoethanol] and further wash steps in buffer C supplemented sequentially with (i) 1% (v/v) Triton X-100, (ii) 1 M NaCl, (iii) 3 mM Mg2+-ATP, or (iv) 0.5 M Tris-HCl pH 7.5. After a further wash step in buffer C containing 35 mM imidazole, the BiP proteins were eluted with buffer D [50 mM HEPES–KOH pH 7.5, 300 mM NaCl, 5% (v/v) glycerol, 5 mM β-mercaptoethanol, 250 mM imidazole] and dialyzed against HKM buffer (50 mM HEPES–KOH pH 7.4, 150 mM KCl, 10 mM MgCl2). The proteins were concentrated, snap-frozen in liquid nitrogen, and stored at −80 °C. Chicken anti-mouse MANF immunoglobulin was produced by Gallus Immunotech (Ontario, Canada) using bacterially expressed full-length MANF (UK 2006) produced as described above. In vitro biotinylation of proteins for use as ligands in Bio-layer interferometry (BLI) experiments was performed according to a previously published protocol50 as follows: N-terminal fusion proteins of AviTag to MANF22–179 (UK1987), SAPLIP22–123 (UK2004), SAP119–179 (UK2005), and BiP19–413 (NBD, UK2022) were expressed in E. coli and purified as described above. After cleavage of the purification tag (GST-TEV or His6-Smt3, to expose the N-terminal AviTag), the purified protein was adjusted to a final concentration of 20–50 µM in biotinylation buffer (25 mM Tris-HCl pH 7.4, 50 mM NaCl, 0.3 mM TCEP, 0.2 mM biotin, 2 mM MgCl2, 2 mM ATP) and biotinylation was initiated by adding purified E. coli BirA (produced in-house) at a final concentration of 0.1–0.5 µM. The reaction was allowed to progress at 30˚C for 0.5-2 h. Excess biotin was removed by buffer exchange into 50 mM HEPES–KOH pH 7.4 and 100 mM KCl. Biotinylation was judged as complete by monitoring the fraction of AviTagged protein that was shifted in mobility during SDS-PAGE by an excess of Streptavidin50 and the protein was stored frozen (−80 ˚C) in small aliquots until use. Experiments were performed on an Octet RED96 (Pall ForteBio) in HKMT buffer [50 mM HEPES–KOH pH 7.4, 100 mM KCl, 10 mM MgCl2, 0.05% (v/v) Triton X-100]. Streptavidin biosensors were loaded with biotinylated components as indicated to ~2 nm, washed in buffer, and then dipped into wells containing analytes to record association, and finally dipped into buffer well for dissociation. The normalized baseline, association, and dissociation signals are shown in Fig. 2c. In the sequential dipping experiment (Fig. 2d and Supplementary Fig. 2a), streptavidin biosensors were loaded with biotinylated MANF or SAP or SAPLIP, washed in buffer, and then sequentially dipped in wells containing BiP SBD, buffer, BiP NBD with 2 mM ATP, 2 mM ATP, BiP NBD with 2 mM ADP and 2 mM ADP. The normalized signals after the first wash step are shown. In the steady-state analysis of BiP NBD and MANF/SAP-binding affinity (Fig. 2e, Supplementary Fig. 2b, c, and Supplementary Fig. 4d), streptavidin biosensors were loaded with biotinylated NBD and dipped into wells containing various concentrations of MANF or SAP. Signals at equilibrium were plotted against analyte concentrations. K1/2 max values were calculated by fitting data from three independent experiments to a one-site-specific binding function using Prism 6. Single-turnover experiments were performed according to a previously described procedure51 as follows: complexes of BiP with ATP were formed in 50-µl reactions containing 30 µM wild-type BiP protein (UK173), 800 µM ATP, 0.444 MBq [α-32P]-ATP (EasyTide; Perkin Elmer) in 25 mM HEPES–KOH pH 7.4, 100 mM KCl, 10 mM MgCl2 for 3 min on ice, and isolated by gel filtration using a illustra Sephadex G-50 NICK column (GE Healthcare) pre-saturated with 1 mg/ml BSA solution and equilibrated in reaction buffer. The complexes were flash-frozen in aliquots and stored at −20 °C. For each reaction, a fresh aliquot was thawed, and after a zero time-point sample has been withdrawn, the remaining complexes were added to reactions containing MANF proteins at the indicated concentrations in the same buffer. The reactions were incubated at 30 °C and samples were taken at the indicated time points and directly spotted onto a thin-layer chromatography (TLC) plate. At the end of the time-course, the nucleotides were separated by developing the TLC plate with 400 mM LiCl and 10% (v/v) acetic acid as a mobile phase. The radioactive signals were detected by autoradiography and quantified. As a positive control, a reaction was performed containing the J-domain of ERdj6 fused to GST (J; UK185). BiP NBD (UK2039) was mixed with an equimolar concentration of MANF (UK2006) or SAP (UK2079) before setting up 96-well screening trays. For the NBD–SAP complex, initial multiple needle crystals were obtained with wizard classic screen 4 (Emerald Biosystem) at 20 °C. These initial crystals grown in 2.4 M sodium malonate and 2.1 mM DL-malic acid pH 7.0 were used as seeds for micro-seeding. Final crystals for data collection grew at 1.5 mM (36 mg/ml) protein concentration in a 96-well sitting-drop plate with 200 nl protein solution, 150 nl well solution (1.92 M sodium malonate), and 50 nl diluted seeds. Crystals were briefly soaked into 1.9 M sodium malonate containing 30% (v/v) glycerol and cryocooled in liquid nitrogen. Initial NBD–MANF complex crystals were obtained with 12% (w/v) PEG 6000, 0.1 M Tris-HCl pH 7.5 from a ProPlex screen (Molecular Dimensions) at 20 °C and used as seeds for micro-seeding. Final crystals for data collection grew at 1.0 mM (30 mg/ml) protein concentration in a 96-well sitting-drop plate set up with 200 nl protein solution, 150 nl well solution [7% (w/v) PEG 6000, 0.1 M Tris-HCl pH 7.5], and 50 nl diluted seeds. Crystals were briefly soaked into 7% (w/v) PEG 6000, 0.1 M Tris-HCl pH 7.5 containing 25% (v/v) ethylene glycol and cryocooled in liquid nitrogen. Lidless BiPV461F (UK2121) was used to co-crystallize with MANF or SAP. Many hits were obtained with a PEG/ion screen (Hampton research), but only BiPV461F was present in the solved crystal structure. Final crystals for data collection grew in 8% (w/v) PEG 1000, 0.1 M Tris-HCl pH 8.5, and cryoprotected with extra 25% (v/v) ethylene glycol. Diffraction data were collected at beamlines in the Diamond Synchrotron Light Source (DLS) (Supplementary Table 3) and processed by the XIA2 pipeline52 implementing Mosflm53 or XDS54 for indexing and integration, Pointless55 for space group determination, and Aimless55 for scaling and merging. All three structures were solved by molecular replacement using Phaser56. For solving the NBD–SAP complex structure, the NBD moiety was searched using PDB 3LDN as a template and the SAP moiety was built manually in COOT57 based on the high-resolution electron density map. Then this NBD–SAP complex and SAPLIP domain from PDB 2W51 were used as search models for solving the structure of NBD–MANF complex. The linker of MANF was built manually according to the electron density in COOT. The structure of BiPV461F (apo) was solved by searching the NBD (PDB 3LDN) and SBD (PDB 5E85) as models, respectively. Further refinement was performed iteratively using COOT, phenix.refine58, and refmac559 (Supplementary Table 3). MolProbity60 was consulted throughout the refinement process, at the end of which 99.5% of residues from the two complexes and 97.5% from BiPV461F were in the favored Ramachandran region and none were outliers. Molecular graphics were generated using UCSF Chimera61 and PyMol (The PyMOL Molecular Graphics System, Version 1.3 Schrödinger, LLC). Nucleotide release kinetics of the fluorescent nucleotide analogue MABA-ADP (Jena Bioscience, cat. # NU-893-MNT) and nucleotide binding of MABA-ATP (Jena Bioscience, cat. # NU-806-MNT) were performed in a Perkin Elmer LS55 fluorescence spectrometer instrument (excitation 360 nm, emission 420 nm). These nucleotide analogues carry a fluorescent MANT group attached to the ribose, which shows a significant increase of fluorescence upon Hsp70 binding31. MABA-ADP release assay: BiP or NBD (UK173, UK2039) and MABA-ADP complexes were formed by mixing 2.5 µM BiP or NBD and an equimolar concentration of MABA-ADP, and incubating at 30 °C for 3 h. The nucleotide exchange solutions contained 250 µM ATP or ADP and protein factors as indicated. The reaction buffer used was 50 mM HEPES–KOH pH 7.4, 100 mM KCl, and 10 mM MgCl2. Equal volumes of the solutions were mixed in a 50 µl quartz cuvette (Hellma Analytics) and the release of MABA-ADP was monitored by the decrease in MABA-ADP fluorescence. The curves were fitted to a one phase exponential decay function (Prism 5) to calculate the release rate of MABA-ADP. Rates were determined from three independent experiments. Stimulated MABA-ADP release experiments (Fig. 5d) were performed likewise but in presence of 0.5 mM CaCl2 and by mixing pre-formed complexes of BiP and MABA-ADP 1:1 with a solution containing 2.5 µM Grp170 (UK2225) and 250 µM ATP. MABA-ATP-binding assay: 2.5 µM BiP (UK173) was mixed with an equal volume of 2.5 µM MABA-ATP in the presence of 200 µM MANF (UK2006) or its mutants (UK2013, UK2079, UK2209, UK2210) in a 50-µl quartz cuvette. The binding of MABA-ATP was monitored by measuring the increase of MABA-ATP fluorescence. The curves were fitted to a one-phase exponential association model (Prism 5) to calculate the observed binding rate of MABA-ATP. Rates were determined from three independent experiments. Purified BiP protein (UK173) at 40 µM was incubated with 1.5 µM lucifer yellow (LY)-labeled substrate peptide (HTFPAVLGSC;62) in the presence of 0.5 mM ADP overnight at room temperature in FP buffer [50 mM HEPES–KOH pH 7.4, 100 mM KCl, 10 mM MgCl2, 1 mM CaCl2, 0.01% (v/v) Triton X-100]. Twenty microliters of pre-formed BiP–substrate complexes were transferred to a 386-well polystyrene microplate (µClear, black; Greiner Bio-One, cat. # 781096) and mixed with 5 µl of 20 mM ATP (final 4 mM), and various concentrations of purified wild-type and mutant MANF proteins (UK2006, UK2013, UK2079, UK2209, and UK2210) in FP buffer. Fluorescence polarization of the lucifer yellow fluorophore was measured (excitation 430 nm; emission 535 nm) at room temperature in a plate reader (Infinite F500; Tecan). The curves were fitted to a one-phase exponential decay (Prism 5) to calculate the rate of ATP-induced substrate peptide release from BiP in the presence of MANF or its mutants. Rates were determined from three independent experiments.